Posted By PA Breast Cancer Coalition on July 30th, 2010 at 4:53 pm | 111 comments. 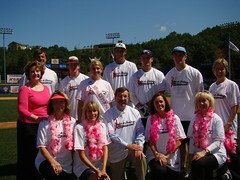 An incredible number of supporters came out to take a swing against breast cancer, including some of Pennsylvania’s VIPs: U.S. Representative Chris Carney; PA Senator Lisa Baker; PA Representative Karen Boback; PA Representative Sandra Major; PA Representative Jim Wansacz; Dr. Dan Kopen and Miss Keystone, Bryn Harvey. Rep. Boback’s teams 1 & 2 were comprised of stand-in batters, including Senator Baker’s son, Carson. Collectively, the teams hit 5 home runs! 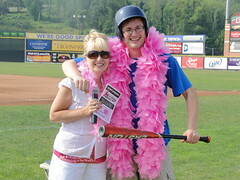 A combination of perfect weather, the emcee expertise of Tammy Miller, interviews with WBRE and WNEP, enthusiastic fans and lots of pink feather boas created the perfect conditions for batters to hit a few out of the park. In other news, PBCC staffers, who are always in search of great food, voted PNC Field concessions to be the best, hands down! Check out the waffle fries! Ten down and one to go! 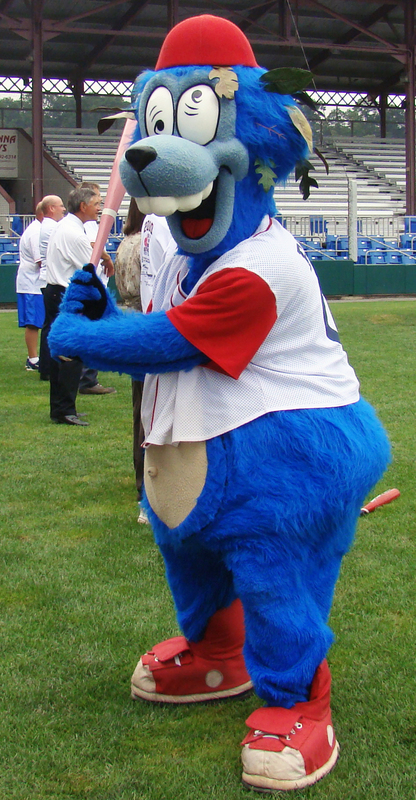 Stay of the look-out for the wrap-up of the Reading Phillies game, which takes place on July 30, and our 2010 Derby season! For now, take a look at the pictures! Posted By PA Breast Cancer Coalition on July 27th, 2010 at 1:08 pm | 112 comments. 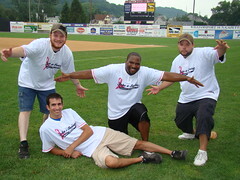 The pink van rolled into Blair County Ballpark on Thursday, July 22nd with only a few home run baseballs handed out at the previous eight derby events. The day at the Curve did not disappoint with 15 home runs! Check out the team scores and the list of home run hitters! Our day was action-packed and had perfect weather! Our winning team, Three Guys & a Senior, found out about the derby the day before the event. 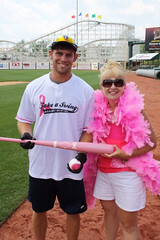 They raised the $500 donation fee and came out to the Curve to take a swing against breast cancer! We are excited to see the community support from this team and the others in Altoona. And a special thanks to Forever Broadcasting in Altoona & Johnstown for the help with promotion of the derby event. Without the outstanding radio assistance provided by Forever, we wouldn’t be able to hold events like these across the state! 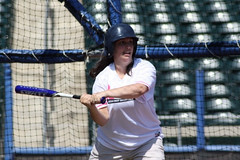 Thanks for your help and taking a swing against breast cancer! A brief break in action as the derby took a break for the weekend. But stay tuned for highlights from the Scranton/Wilkes-Barre Yankees derby soon! In the meantime, check out all of the photos from our day at the Altoona Curve! Posted By PA Breast Cancer Coalition on July 27th, 2010 at 11:15 am | 991 comments. It was a brief day at the State College Spikes, but one batter delivered three home runs to help his team take home the coveted pink baseball bats. Team Reliance Bank racked up 1,425 points to take home the pink for the day. Led by Brandon Myers who hit three home runs out of the park, the team had a great showing in the outfield. Check out how the stood against our other batters for the day. A few Spikes players came out to support the day and show off their pitching skills. The foursome alternated shifts to run the pitching machine and even throw a few pitches for our single batter Skyler. The PBCC thanks the Spikes for another great event with great weather! And another thanks to Brooke & Skyler Woodward to stepping up to the plate! We hope you had fun at the ballpark! Our journey continued on to Altoona with a double-header set of derby events. But first, be sure to check out all of the photos from Medlar Field at Lubrano Park! Posted By PA Breast Cancer Coalition on July 27th, 2010 at 10:05 am | 133 comments. Now that we are over the half-way point, derby events just seem to happen. The great staff at the PBCC & PACB in addition to support from all of the participating stadiums, these derby events make the month of July seem like only a few days. 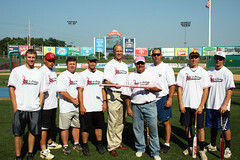 To kick off a week of derby events, the pink van was in Allentown at the Lehigh Valley IronPigs on Monday, July 19th. The great staff and volunteers at the IronPigs made the day run smoothly. So smooth, in fact, check out how high our team scores were for the day! Even though we had very high team scores, no one was able to knock one out of the park! Our batters knew where to hit the ball to the outfield, but they were just shy of the fence! WFMZ Channel 69 was out at the ballpark to support the cause. Check out the story! 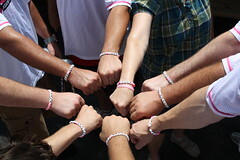 The Harleysville Savings Bank teams were sporting specially made bracelets for the derby. ‘Barb’s Batters’ stepped up to the plate to support our volunteer Barb Eyrich from Harleysville Savings Bank. Lookin’ good fellas! Thanks to everyone for another great day at Coca-Cola Park! Head on over to Flickr to check out all of the great photos from the beautiful Monday! Posted By PA Breast Cancer Coalition on July 23rd, 2010 at 10:26 am | 134 comments. Another derby event in a back-TWO-back competition was held in Lancaster at Clipper Magazine Stadium on Saturday, July 17th. The heat was on and all watched in anticipation of the second day of the War of the Roses. Of course all of our teams were up against tough stats from the first half of the derby season: single-digit home runs. We’ll check out those figures in a little bit. But first, let’s see our team scores! It was a tough race for the War of the Roses, but Team Rep. Scott Boyd pulled out another win to take the 2010 War of the Roses title. Although Team Boyd fell second to Team Sen. Mike Brubaker’s squad. The battle for first was tough, but in the end both teams came together for a friendly photo with the pink bat! Our dryspell of home runs gave way to a list of hitters who knocked on out of the park! Jordan Stoltzfus, Matt Waleuski, Mike Wilson, & Greg Gunter all were able to hit one out of the park! Hopefully this momentum will keep the derby home runs coming! 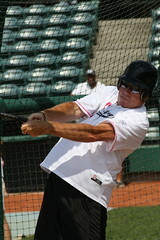 Take a look at the great pictures from the Lancaster Barnstormers Home Run Derby! Posted By PA Breast Cancer Coalition on July 23rd, 2010 at 8:20 am | 103 comments. The topic of heat and humidity were on the minds of our batters and volunteers, but the weather did not deter from a great time at Sovereign Bank Stadium, the home of the York Revolution! This event kicked off the War of the Roses between Rep. Eugene DePasquale of York and Rep. Scott Boyd of Lancaster. Both teams came prepared for battle on the diamond. Check out how they did below! Looks like Team Boyd won on the York turf for a second consecutive year. This didn’t deter Team DePasquale from looking forward to Lancaster for another challenge! Early in the day, WPMT Fox 43 went LIVE from Sovereign Bank Stadium to help promote the derby to south-central PA. A special thanks to Mike Gorsegner and the entire Fox 43 staff for that wonderful opportunity! Stay Classy, York made an appearance on Friday. On his trip around the Commonwealth to six derby events, Bob Hauer helped to lead his team to fourth place with 1,170 points. Not a bad showing out on field! With a mini-Green Monster in left field and the possibility of weather affecting our batters, we did not have any home runs in the White Rose city! We look to Lancaster to help boost our home run tally for 2010. In the meantime, check out photos from the derby event at the York Revolution! Posted By PA Breast Cancer Coalition on July 20th, 2010 at 9:45 am | 1137 comments. The weather cools down as the competition heats up! Compared to a boiling week in the eastern part of the state (which topped the charts at 102 degrees- yikes! ), a day at Williamsport’s Historic Bowman Field seemed refreshing with temperatures in the mid-80s. Mike Mussina, former New York Yankees pitcher, joined us at the plate for the second year in a row, leading Team Alexander/Representative Garth Everett to victory and tabulating a personal score of 425 points. With rain in the forecast, the weather almost tampered with the Derby’s success. Nonetheless, the precipitation held off in time for Team Best Buy, who sent eight volunteers out to help shag balls in the outfield, to wrap up our day at Historic Bowman Field. Thanks, Best Buy! Stayed tuned for news from this coming weekend, which I predict will be action-packed and exciting. The PBCC will be venturing to Sovereign Bank stadium, home of the York Revolution, on Friday, July 16, and then finishing up this eventful week with the Lancaster Barnstormers at Clipper Magazine Stadium. For hot-off-the press derby updates, don’t forget to follow iKevin on Twitter and check out his real-time travel map on the official Derby website. Posted By PA Breast Cancer Coalition on July 13th, 2010 at 9:40 am | 107 comments. With temperatures in the high-90s, the third stop of the Home Run Derby at the Washington Wild Things was shaping up to be the hottest ever! The heat was on and one batter was able to knock one out of the park!! But first, check out the team scores! With sunscreen in tow, our batters were hitting the baseballs almost out of the park. One batter was lucky enough to get a ball out of the park! Mitch Monas from Team First Federal Savings & Loan of Greene County knocked out our first home run of 2010! He is pictured here with our emcee Tammy Miller and the rest of his team. 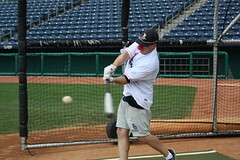 Team WPXI was back out at CONSOL Energy Stadium to attempt a few home runs. Last year’s team score was 1,090. This year, there were side bets on the table. Scott Harbaugh, Alby Oxenreiter, Bill Phillips, and Rich Walsh had a total 2010 team score of 1,065 points. They didn’t beat last year’s score, but I believe there was an expensive dinner up for grabs. Thanks for supporting the derby again this year fellas! After loading up the pink van, the PBCC team drove 4.5 hours back to southcentral PA to rest up for the next stop: Williamsport’s Historic Bowman Field. Stay tuned to find out those results soon! In the meantime, be sure to check out pictures from the Washington stop of our tour!